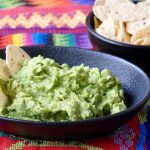 This quick and easy recipe for Guatemalan guacamole will take you less than 5 minutes to make and is the perfect appetizer with tortilla chips or as a side with tacos. Mash avocados with a fork in a non-metallic bowl until an almost smooth consistency. Serve immediately or store briefly in the refrigerator covered in plastic wrap. If you keep the avocado pits in the guacamole while storing it, it seems to help prevent the guacamole from turning black as quickly.